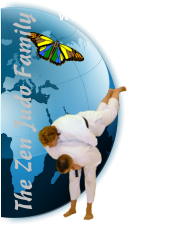 The Zen Judo Syllabus - Blue to Brown. All techniques from previous sections. Soto Gake: This throw is built on ko soto gake from the orange to green syllabus. However, this time the throw is completed by raising your blocking leg up to block the upper part of your partners leg behind their knee. There should also be more impetus on the initial breaking of balance. Harai Tsuri Komi Ashi: Many judoka at this level say that this is one of the most difficult techniques as it relies on balance and timing. It can be done as both a standing technique such as sasae tsuri komi ashi or as a walking technique similar to ko uchi gari. One of the most difficult parts of this throw is being able to make your partner step forward, whilst stepping forward on the same side. This will leave you clear to sweep the other foot behind the weight-supporting foot. O Soto Gari: This can be one of the fastest throws in the syllabus, so it must be done with control. The act of sweeping your partners leg can make them hit the ground with a high velocity, so breakfalling is very important. When executing this sweep, the sweeping leg should be kept straight. If it is hooked, it could get tangled with your partners which could lead to injury. Sumi Otoshi: Many students will recognise this throw as a basic counter-one. The reason it is kept until now is due to the power that this throw can generate. It has three different versions; to the front and to both sides. It should be conducted as a single swift movement. Hiji Otoshi: This technique should be conducted in the same fashion as sumi otoshi. The difference in this throw is the movement of the hand from lapel to arm. By controlling both ‘wings’ of a person, you gain more control over their balance. Hane Goshi: The only way to do this throw correctly is to practice, practice, practice. For a student to use this throw successfully you need to be truly comfortable with lifting your partner onto your hip, and to “spring’” them off. The entrance for this throw is the most important part, if a student does not get in close enough to their partner, the technique will not work. Kata Guruma: This technique is not often seen outside of kata as it requires perfect control and position. It is also a very slow throw which does not lend itself to fast randori. The key to this throw is to get your entire body underneath your partners centre of gravity. When the lift is attempted, if your partners belt is not on the back of your neck then their balance will not be centred on your shoulders.